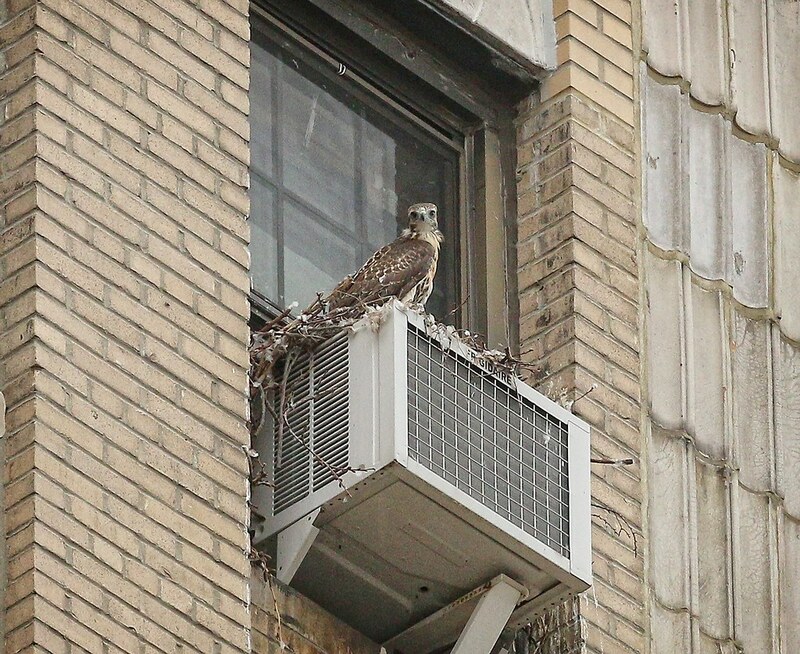 The second hawk fledge on Avenue A happened at 2:45pm on Saturday, June 20. I was actually able to see it happen. Two days later, the adrenaline still has me shaking. 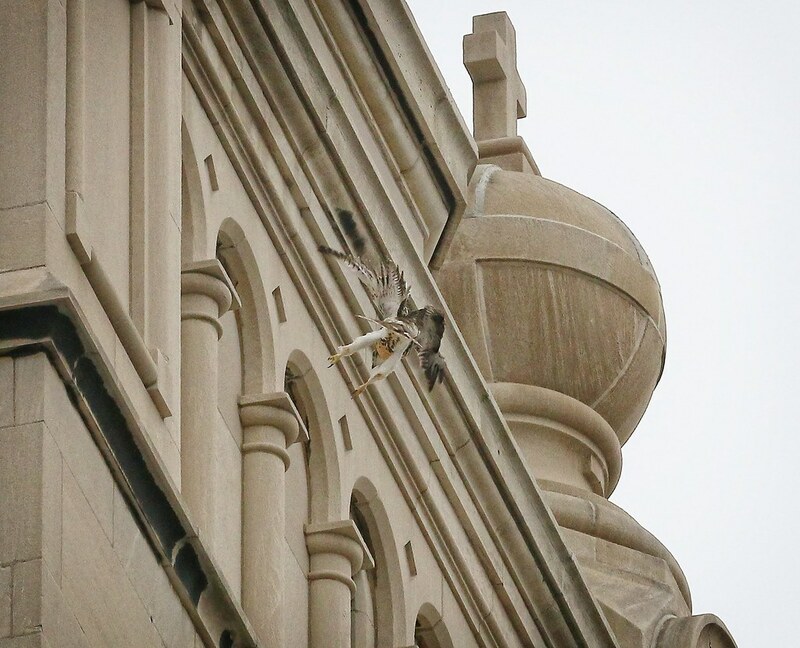 I don't think I've ever seen any bird leave its nest for the first time, so seeing a baby hawk take its first flight was an absolute thrill for me. 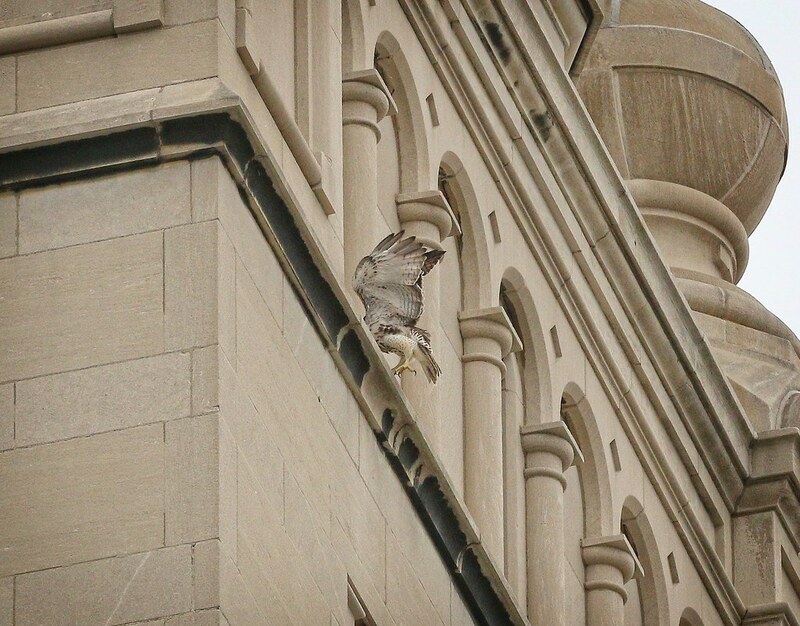 It started flapping, but looked more determined. 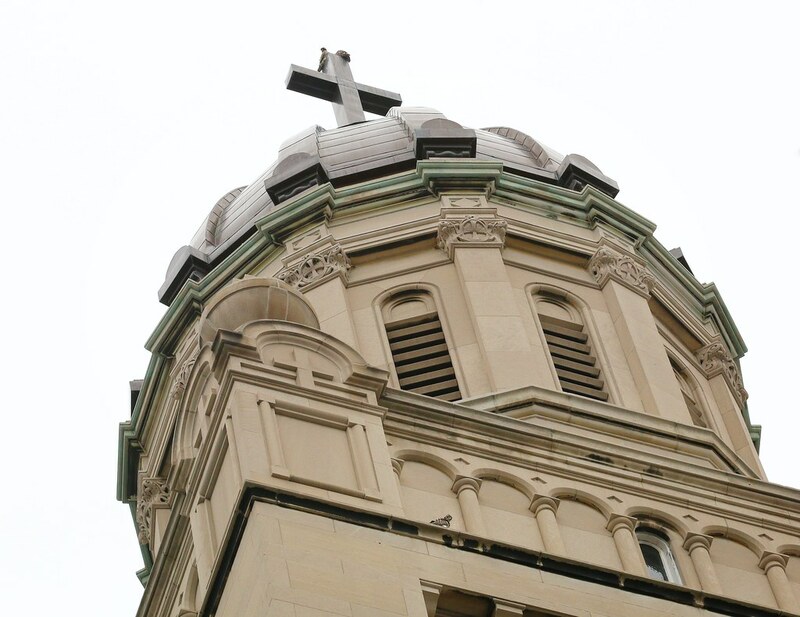 It kept looking at Most Holy Redeemer church, where both parents sat atop the cross. Suddenly, it was up in the air! 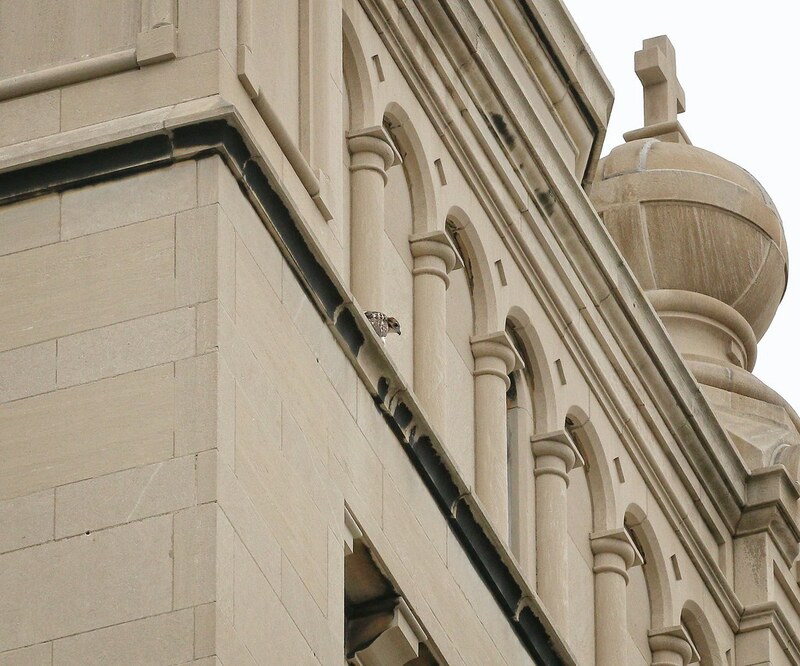 A collective cheer rang out in the street below, where a crowd had gathered to watch. 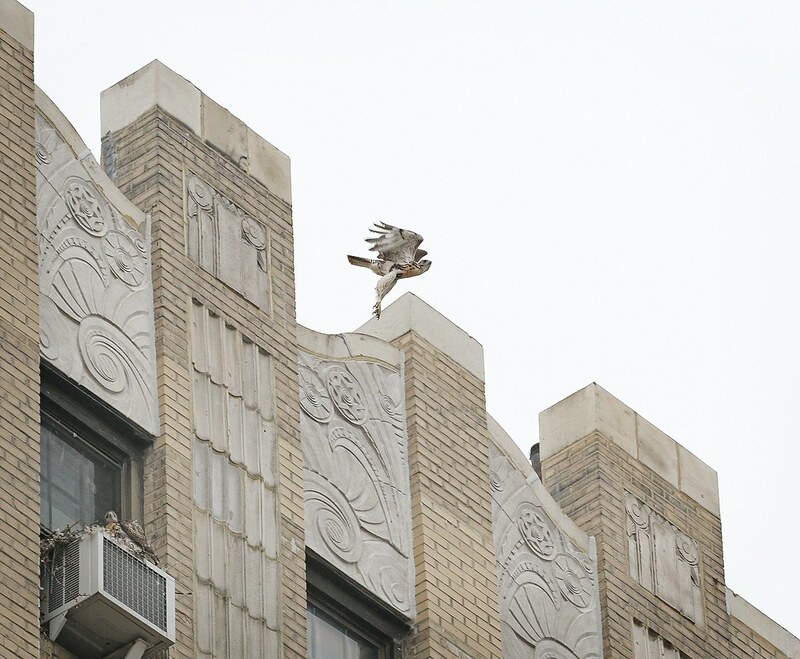 It managed to get really good height, flying higher than the 12-story building. 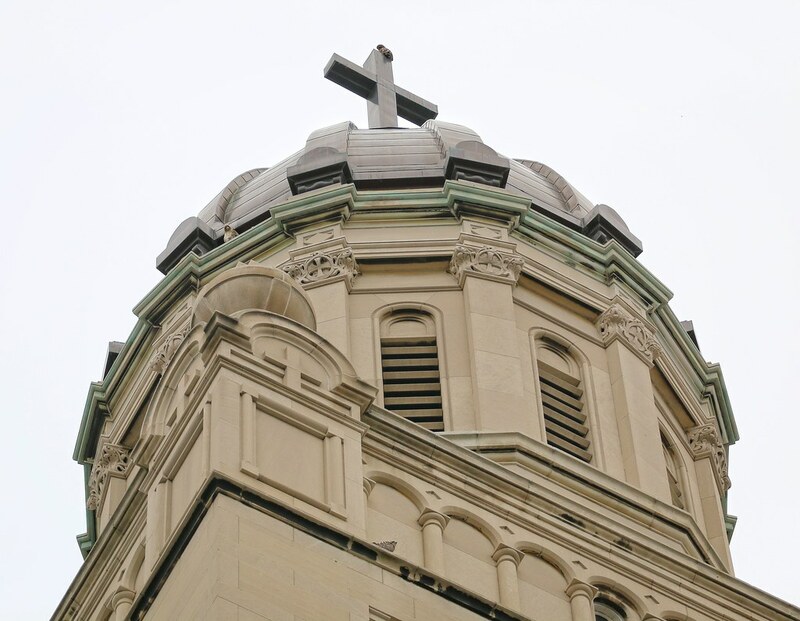 It flew high over the intersection of Avenue A and 3rd Street, then banked left and sailed east on 3rd Street towards the church, where its parents still perched. 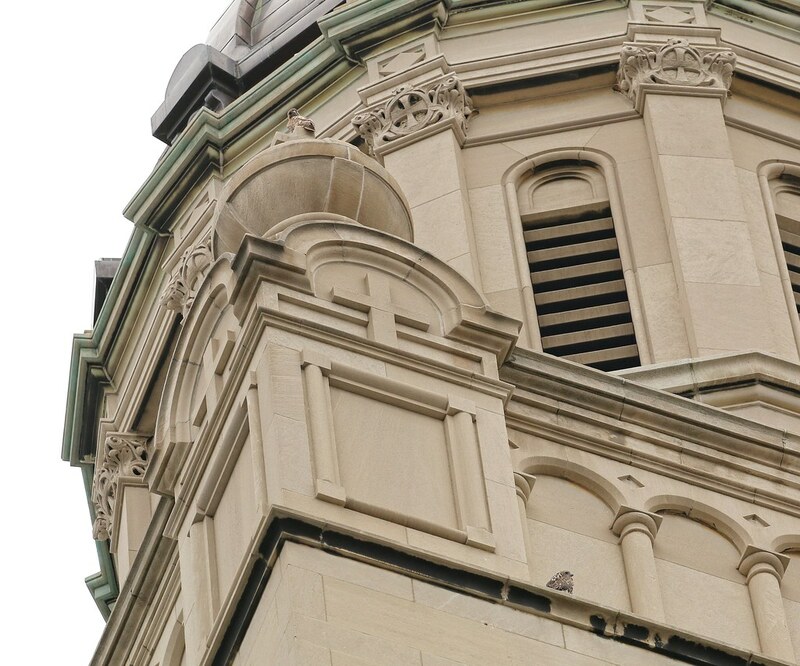 It then made another left turn and headed straight for a ledge on the south side of the clock tower of the church. It sort of dove in face-first, but stuck the landing. Did I just do that??? 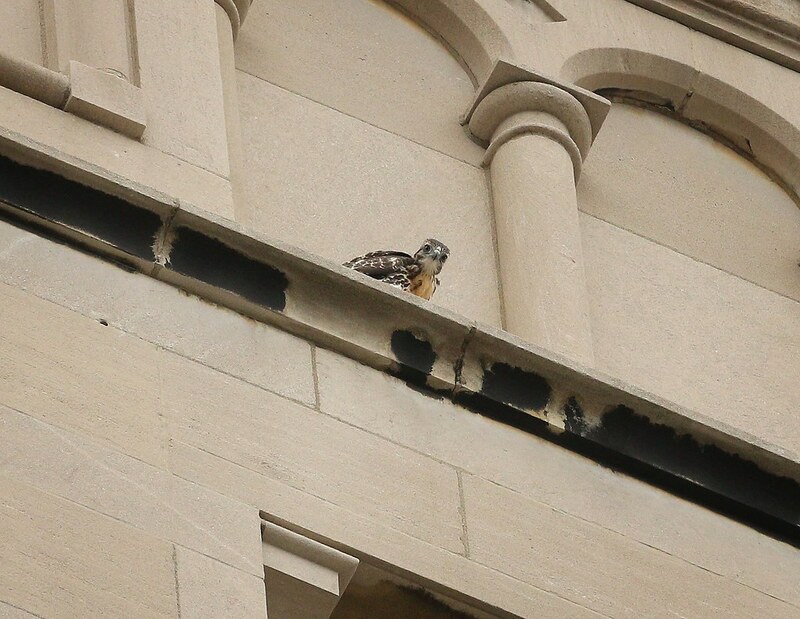 Here you can see the fledgling on the lower ledge just as dad Christo takes notice from the cross above. 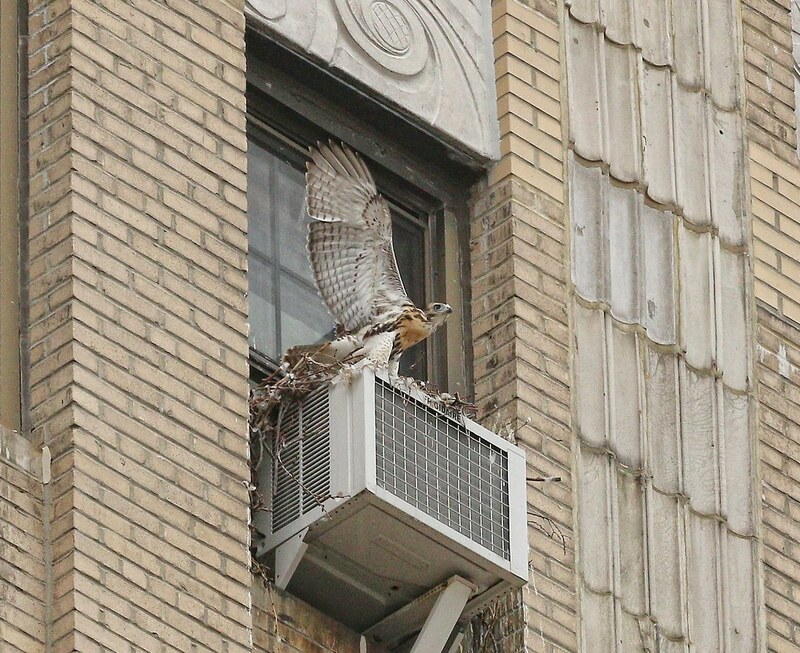 Christo then came down lower to check on the fledgling. He is on the green ledge on the left, while mom Dora remains up top. Christo then moves closer, on top of the globe on the upper left. Thinking the fledgling would stay put for a while, I went to look for its older sibling. 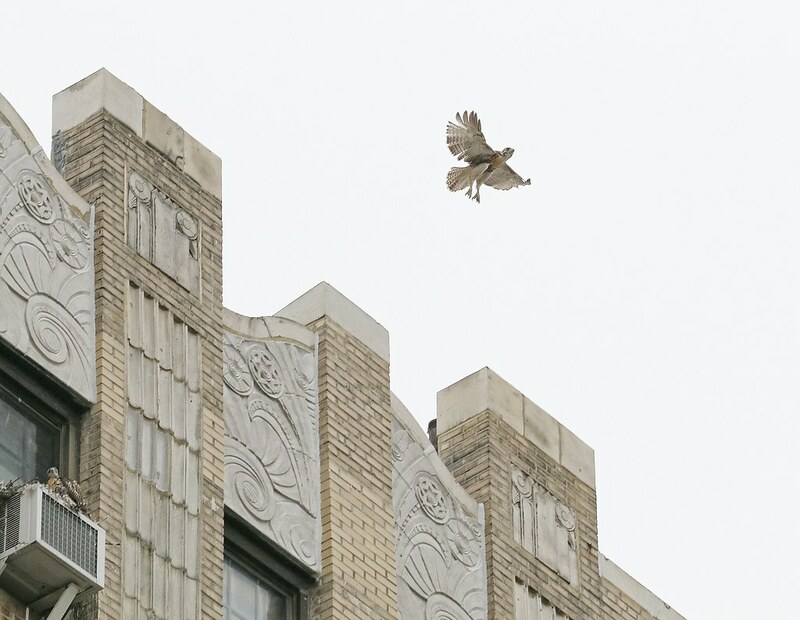 To my surprise, a short while later, a fellow hawk-watcher let me know the fledgling had flown from the church all the way over to PS 63 just west of Avenue A. When I arrived, I found it near the ball court being mobbed by a gang of robins and sparrows (welcome to the real world! ), but it seemed ok otherwise. I left it practicing its moves on the high bar. 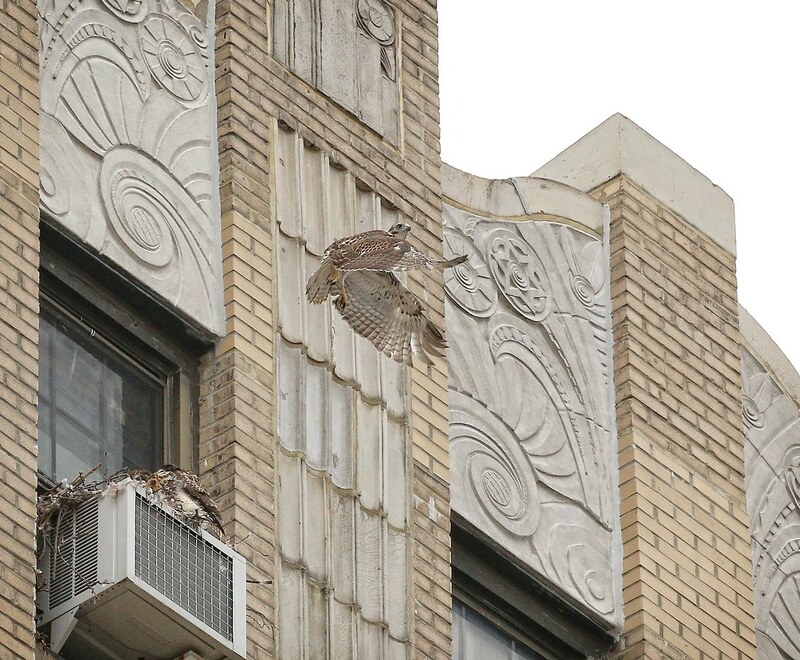 I was really impressed by this fledgling's flying skills. 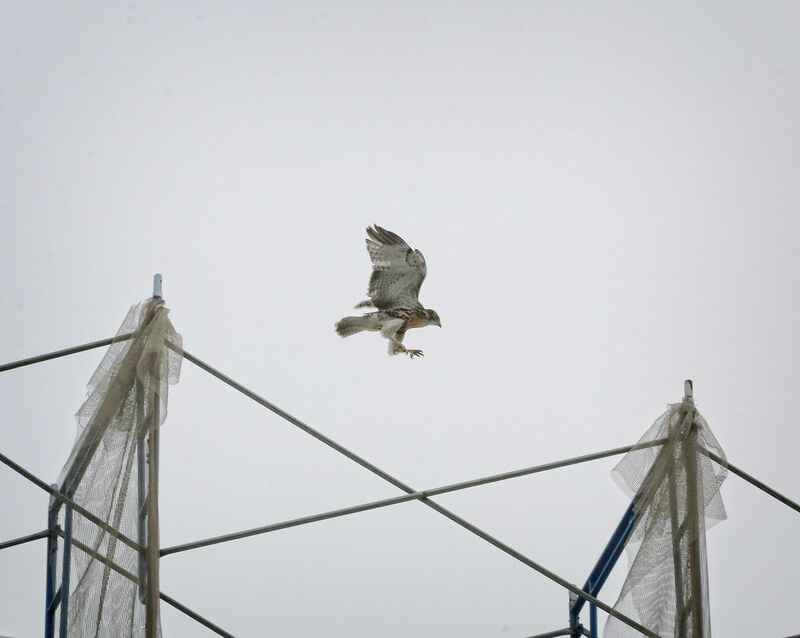 Two days later (today), I watched it soaring and catching thermals like a pro. 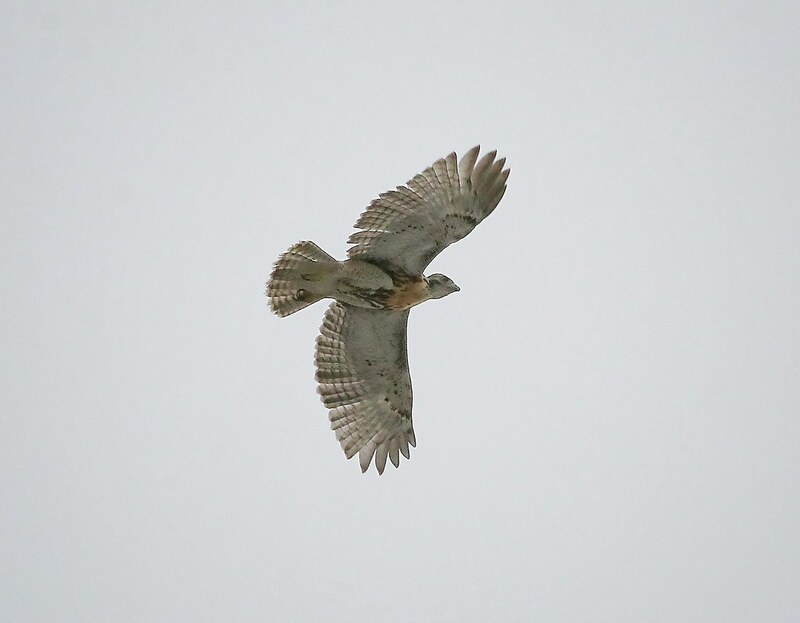 To recap, this hawk hatched on either May 1 or 2, putting it at 50-51 days old when it fledged. 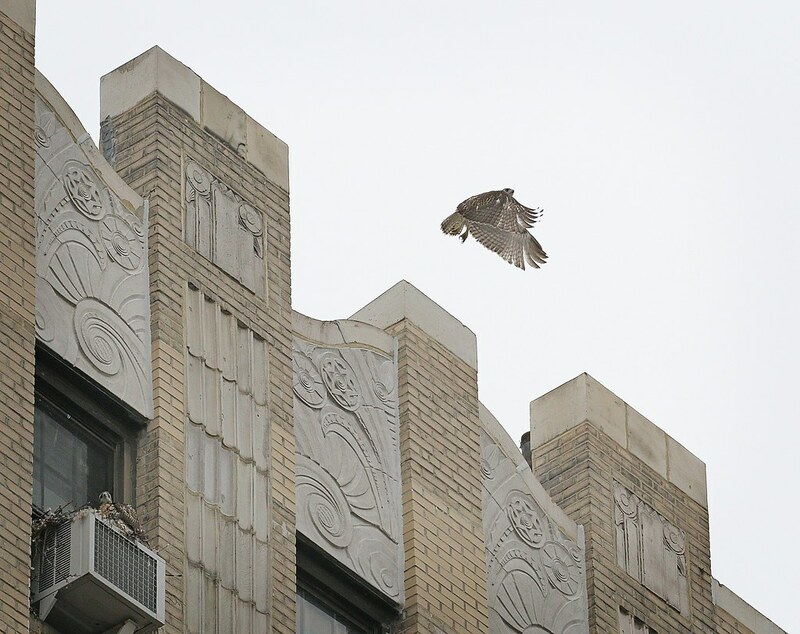 Two Hawks NYC also has a post on this fledge. 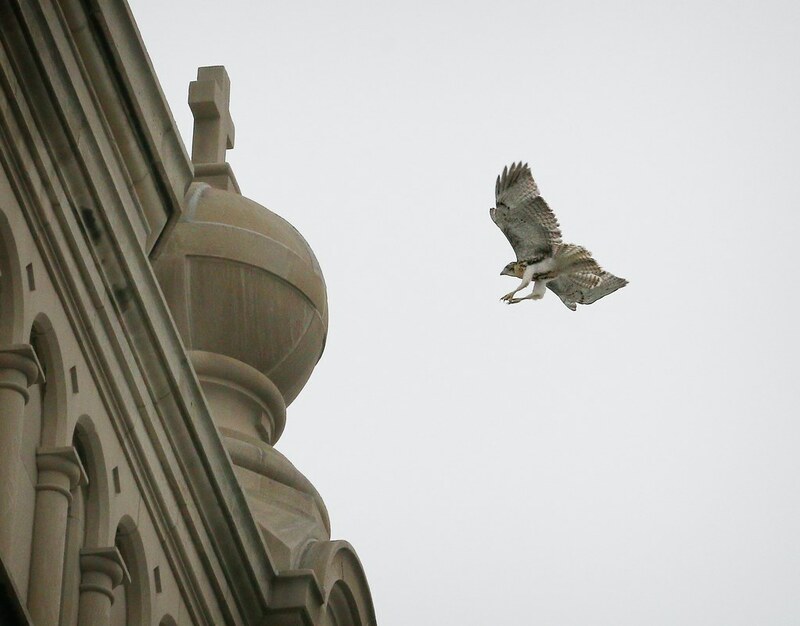 Urban Hawks has nice photos of both fledges as well.